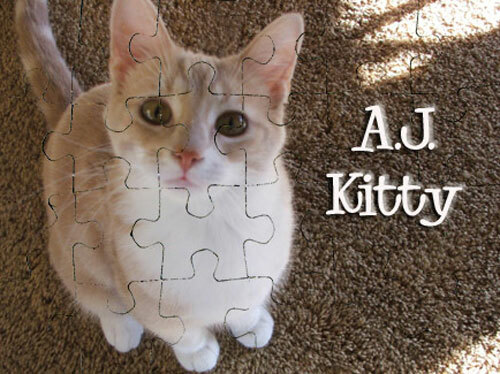 Have your own Photo created into a 4" x 6" Personalized Photo Puzzle that has a Magnetic Backing. Now your puzzle can be put together on the side of your fridge or any magnetic surface. Puzzle is laminated onto thick cardstock just like the store bought puzzles! Add text to your puzzle - Text can be added either in the border or over the photo. The Border can be any color you want. both a border and text! Each Puzzle is created especially for you in our US Based Factory. The puzzle is made from thick card stock. The image is printed on photo paper and bonded to the card stock so that it will become a family heirloom that will last forever. Puzzles will not fade or loose their color. This product is great for ages 3 and up. Any photo will work - black & white or color. But keep in mind, the better the photo, the better the finished puzzle. A clear (in focus) photo is necessary. 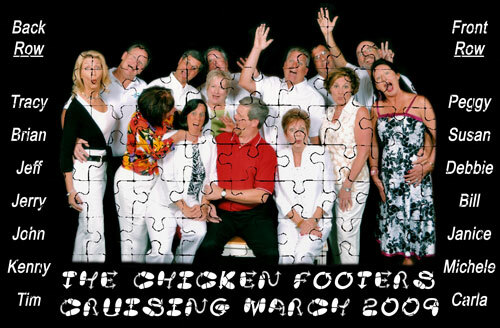 We will notify you if the quality of the photo prohibits making a great quality puzzle. We will compose your photo to fill the puzzle as completely as possible. Usually if your photo is a portrait then the puzzle will be made in a vertical format. If the photo is a landscape, it will be made in a horizontal format. The main subject of the photo should be different in color and contrast then the background of the photo (i.e. - it is difficult to see a black dog sitting on a black sofa in a dark room). The main subject of the photo should occupy about 75% of the photo. We will crop your photo for you to get the best image possible for your puzzle. If you do not wish for us to crop your photo then please indicate this in your order. For best results the fewer the better. 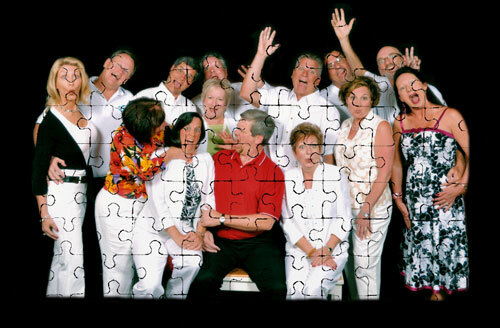 The more faces in the photo the smaller each face will be on the puzzle and the less detail of each face. However, 2-5 faces works well if you are not doing a team photo. Please do not send photos with borders, fade-outs, snow effects or shadow effects as they will not duplicate well in the puzzle. Yes, just select that option and tell us what you'd like it to say. We prefer to receive digital photos via email or the Upload Tool since it is much faster to process your order and less expensive for you. It also keeps your photo safely at home with you. Physical photos of all sizes will be accepted, but the sizes that make for the best results are 3x5, 4x6, 5x7 or 8x10, the larger ones being the best. Yes. All physical photos are returned to you. Normal delivery time is 2 to 4 weeks from when we receive your photos and text. If you mail us a physical photo to scan we can not begin your order until we receive your photos. Yes. Please select the Rush Shipping option. The times shown is the time between getting your photo and delivery of the finished product to your door. Discounts are available on purchases of 10 or more of the same item using same photo. Please contact us at 803-485-1544 or email us at Blankets@KidMusic.com for a quote. This item is shipped directly to you from our factory. It may arrive seprately from other items in your order. Yes, please select the colloge puzzle to add additional photos. This item can only be made with one photo. Our products are warrantied to be made correctly per your order information. Please confirm your order information before completing your order. If you should find that something is incorrect please contact us to have it corrected before your order is shipped. For more details about our policies regarding Shipping, Replacements, Returns, etc. please use the Frequently Asked Questions link above. This item requires several weeks to produce and ship. Please select the production option that best fits your needs.